Today's Monday Map shows the impact of the imminent expiration of the Bush tax cuts by state. Connecticut, where taxpayers stand to pay an average of $5,783 more, would be affected the most; Mississippi, with an average tax increase of $1,310, would be affected the least. 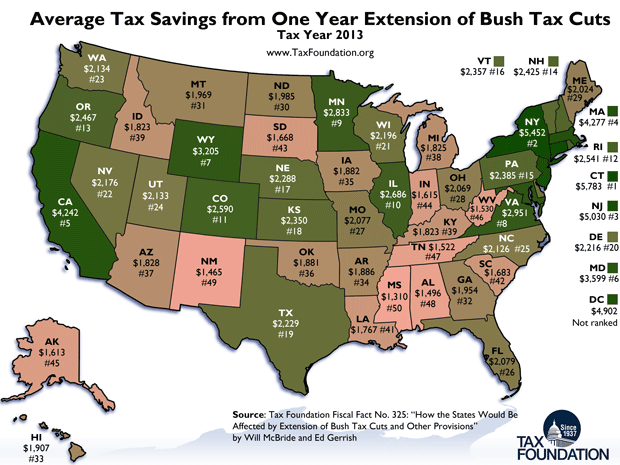 The data comes from our recent publication "How the States Would be Affected by Extension of Bush Tax Cuts and Other Provisions" by Will McBride and Ed Gerrish. To view previous Monday Maps, click here.